I have a poem pinned up by my desk that is printed on a bright green card and titled “A Poem To Pray For Spring.”I picked it up in a bookstore somewhere a few years ago and have had it up on one wall or another ever since. Peering at the back of it now, I see that it was a promotional piece for a poetry anthology, and that the poem turns out not to be titled that at all, but rather to be a segment of a very long poem by Swinburne called “Atalanta in Calydon.”Swinburne is worth a google or two just for the hairstyles you will see represented, and for the fact that he attended Oxford except for a brief period when he was “rusticated.”I think that is almost as good a word as “defenestrated,” except that it only means “suspended,” whereas the latter is a fancy word for throwing someone or something out a window. You may also discover (or I can save you the time) that Oscar Wilde said of Swinburne that “he perhaps professed to more vice than he actually indulged in,” which is a pretty pithy epitaph. Of course--I am sure you were thinking the same--this leads us right to soup.Of course!When I came across this parsnip soup recipe, all the comments raved about its springiness and its lovely bright green color, which made me think of the poem on the card, natch.If you make this soup, you may find that it tastes like it has cream in it, which relates in some meaningful way to professing to more vice than you indulge in, and proves something--about parsnips, or poetry, or something that might be wrong with my mind. About the soup stock: I was a vegetarian for so long that I kind of don’t miss chicken stock as a base for most soup.I just use water, generally.Making vegetable stock is tricky; making one that does not taste like dishwater takes some time and patience.Buying it is tricky, too, the shelves laden with over-salted, fakey-flavored and BPA-laden liquids that will spoil your soup.Water won’t ever do that to a girl. Now I am not a vegetarian anymore, but still I usually make soup with water as the liquid.Thanks to this hot tip, I also now have a nice little stash of vegetable stock concentrate in the fridge, and that is so worth the hour it took to make it.Fear not the making of this concentrate; it is child’s play (except don’t let your child play with the food processor, not on my recommendation anyway) and it is money in the bank. I used it to make this soup, but I think you could be happy using chicken stock if youhave access to a nice one or just fiddling around with salt and lemon as seasonings.I added no salt other than what was in my components here, because the parsnipitude shines nicely without it. Heat butter in a 4 to 6 quart pot over medium heat. Add the chopped leeks and toss to coat. When the leeks are heated enough so they begin to sizzle in the pan, lower the heat and cover the pan. Cook until soft, but don't let the leeks brown. Add the parsnips and olive oil, and toss to coat. Add whatever version of stock and water you are using, and the strips of lemon zest or little chunk of preserved lemon. Bring to a boil and reduce to a low simmer. Cover and cook until the parsnips are completely tender, about 15 minutes. If you used lemon zest, remove and discard it. Add the parsley. Purée the soup until smooth, either by using an immersion blender or by working in batches with a stand-up blender and following sensible precautions so you do not explode the hot soup all over yourself. Adjust salt to taste, if needed. 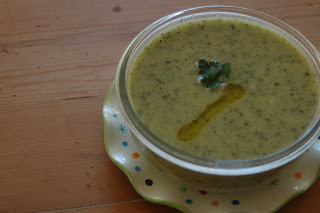 Festoon the top of each bowl of soup with a squeeze of lemon, a dribble of olive oil and some parsley.Admire the color.Toast to spring.